You all know that Jaxen and Ava are my babies. I love them like I love Adalyn. Over the years, they have accumulated quite a few costumes. 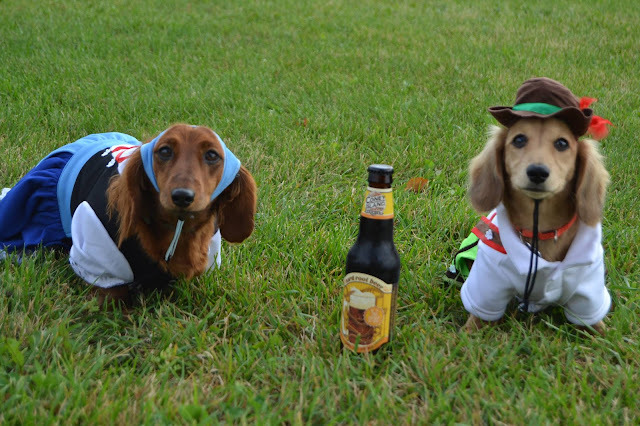 We love putting them in their costumes because they are just too cute! When you have kids, it is easy to forget about celebrating the holidays with your pets. Last year may have been a bit crazy with a 1 month old baby but this year, I am ready to go for my dogs. While they will not be going trick-or-treating with us (they think they own the city and bark at every single person to walk by), we will be celebrating with them before and after. Squirrel man! Look how distinguished he is. Adalyn is going as a bee one day and a chicken another day. Jaxen is dressing up as a squirrel (I just can't- everytime he wears this, it is just too funny). My parent's dachshunds will be decked out in German lederhosen and a German lady costume. Haha, we have been dressing up our dogs for years. I think that next year, I may need to coordinate the dogs costumes and Adalyn's costume. Ava in her hot dog costume! While this may be more for you then them, it is still fun to include them in on the fun. My dogs have a hot dog costume, a squirrel costume, a banana costume, a bunny costume, a gingerbread man costume, etc. etc. We enjoy Halloween with the dogs! Certain dogs do not like being around a lot of people and can get anxious and scared. If your dog is like this, keep them safe at home and away from the door of trick-or-treaters coming by. They will be happier this way and will be safe. If you do take them our trick-or-treating, watch out for them eating candy or running into decorations or candles that can cause injury. Keep your pets safe! Along with passing out candy to the kids, you can have a basket of dog treats to pass out for any dogs coming by. This would be a great way to include them. For the dogs, I picked up some Purina Beyond Snacks which is a healthy treat for your dogs. This way, you can give them a treat, they enjoy it and you don't have to feel bad about giving them something unhealthy. I picked up the Purina Beyond white meat chicken cutlets natural dog snacks from Target. As a dietitian, I watch what my pets eat carefully because I want them to be at their healthiest. With this product, I know I can feed it to them without issues. They are made with chicken as the first ingredient, are grain-free, contain no corn/wheat/soy, and have no artificial colors, flavors or preservatives. They are USA made. I also got the jerky strips which my dogs went so crazy over. They love them both! 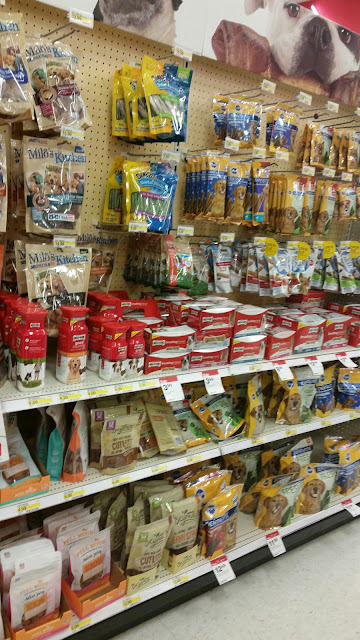 To save on your purchase, use the Target Cartwheel offer for 10% off Purina Beyond Dog Snacks at Target, available from 10/4-10/31. They look so cute in their costumes. We've tried to dress our dog up, but she wants nothing to do with it and pulls the costume right off.